The last two days have seen record-breaking hot temperatures across the Eastern United States, including in Southwest Virginia. Yesterday it was 103 in Kingsport and 101 in Bristol, breaking the record high temperature ever recorded in the month of June in our region. Abingdon was 100, the highest temperature here in any month in 25 years. It’s way too hot, especially for those of us in the mountains. I’m pining for cooler weather−way cooler weather. 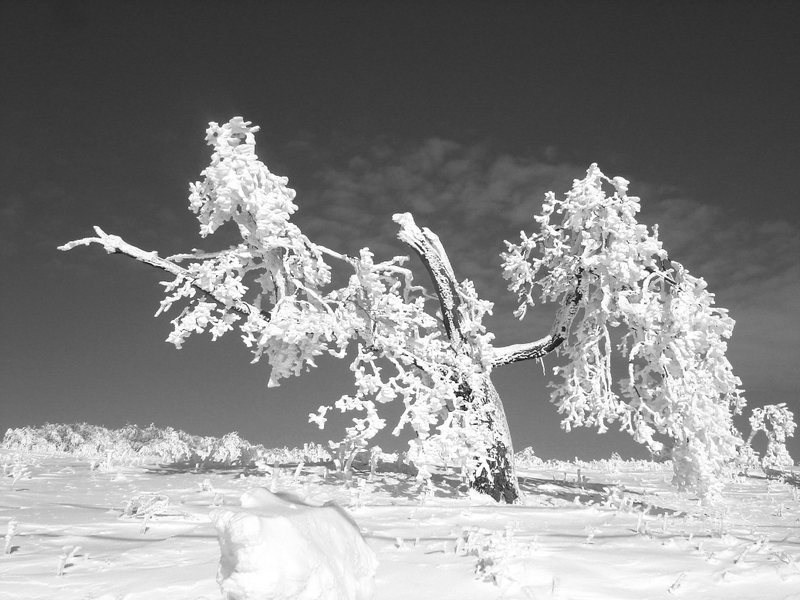 Along those lines, the B&W photo I took above shows massive hoarfrost on one of the solitary trees up on Whitetop in 2010, the last real winter we have had in Southwest Virginia. Just looking at that photo cools you off a little bit, doesn’t it? Wish I was high up on a mountain with snow right now.